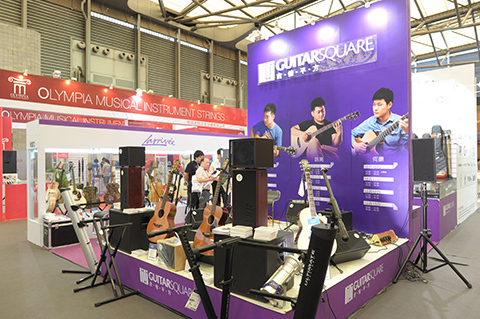 On october 10 to 13, 2013, the twelfth Shanghai International Exhition for Muscical Instruments and Services fell on the appointed time. 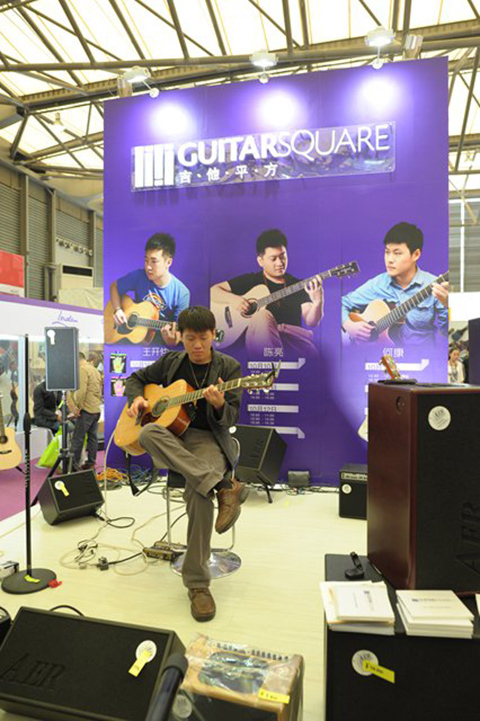 Kane, founder of Guitar Square, personally led his team to leave for Shanghai to attend the annualy grandest musical instrument show of Asia. 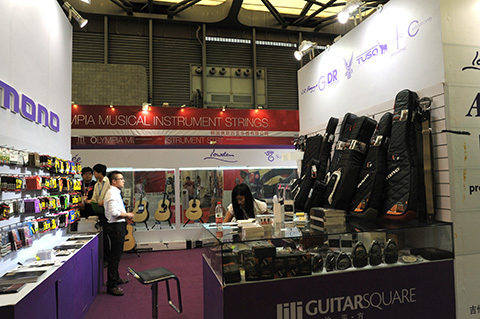 Shanghai International Exhition for Muscical Instruments and Services hitherto has passed 12 years and already become the world-renowned instrument culture event. 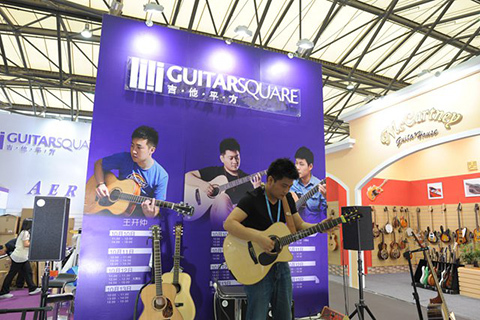 Kane, founder of Guitar Square, led his team from Qingdao to Shanghai to participate the grand ceremony of musical intruments, in the hope of turning a new leaf in the future developemt of Guitar Square. 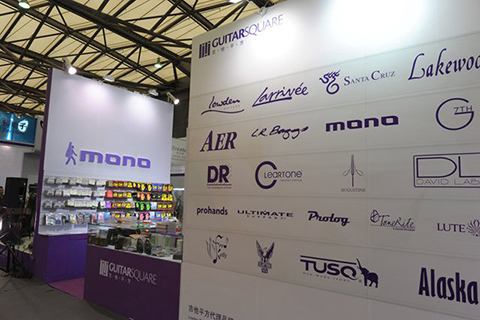 On October 9, Guitar Square reached Shanghai with the full line agented products in order to make full preparation for the following day’s Show. The agented brands brought were: Larrivee Acoustic Guitar, Lakewood Acoustic Guitar, SantaCruz Acoustic Guitar, Lowden Acoustic Guitar, AER Amplifer, Ultimate Support, TUSQ Saddle, G7th Capo, Prohand Hand Exerciser, Clayton Picks, Fredkelly Pick, Alaska Pick, Mono Case and Strap, L.R.Baggs Pickup, Prolog Foot Drum, Lutehole Soundhole Cover and Tonerite Opening Sound Device. 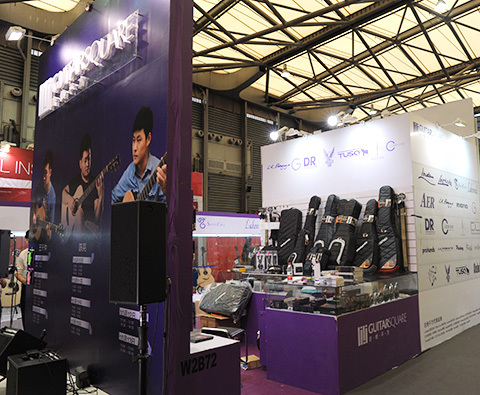 After busy arrangement, Guiar Square’s booth was major in fresh and elegant purple, matched with high-end and stellar musical instruments, which was naturally obvious in such a huge hall. People who came to the booth was in continuous stream, there being domestic and foreign clients, covering retailers and wholesalers. 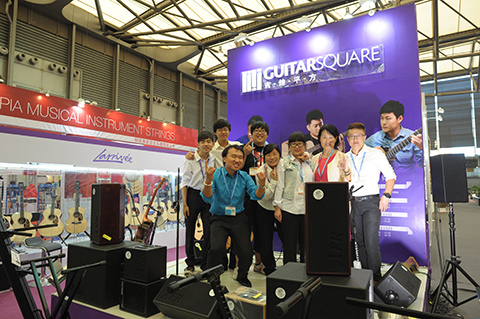 There were also music stores wanting to develop sincere cooperation with Guitar Square. 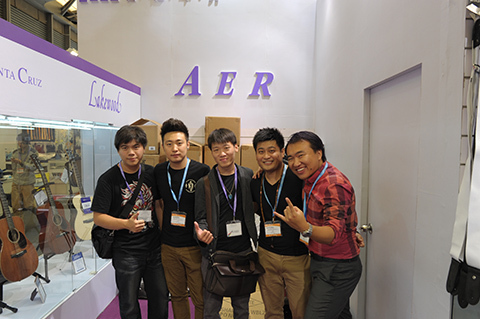 Particularly, Udo, CEO of AER Amplifer, Jean Larrivee, founder of Larrivee acoustic guitar, and his assistant Joe, Zach, Global Sales Director of L.R.Baggs, Noel, General Manger of G7th Capo, Dafe, TUSQ General Director and his sales manager Will visited the booth and respectively held meething with Kane. 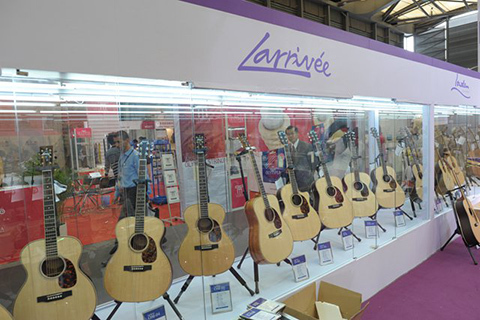 On the conference, Kane, with each representive of manufacture, reviewed the sales of their products in China and looked forward to the future. 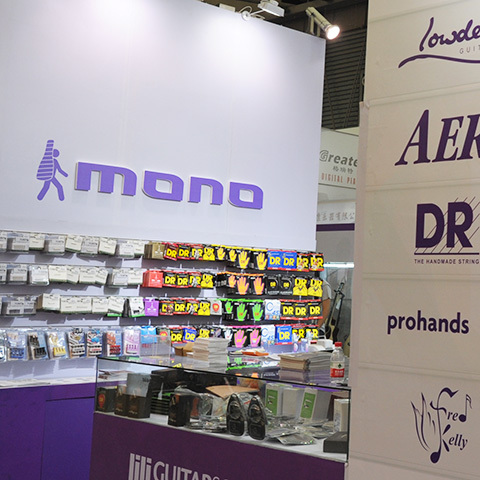 Both parties discussed future cooperation and set sales target in 2014, writing a new charpter for the subsequent develeopement of both companies. 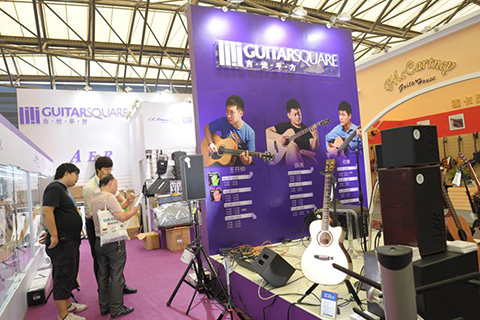 At 7 o’clock on October 10, Guitar Square held nation-wide dealers banquet. What’s more, Udo, Jean, Joe, Zach, Noel and his wife personlly joined the banquet, which added liveness to the dinner. 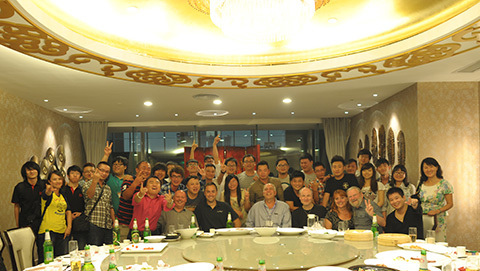 During the dinner, each dealer propesed the toast with foreign manaufactures in joint celebration of the successfull opening and everlasting cooperation. 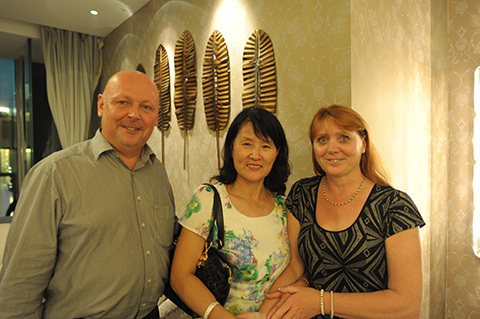 Meanwhile, foreign manaufactures exchanged ideas with dealers and listened carefully to their feedback and advices. Every colleague who enjoyed the banquet was like from one family and talked kindly with each member of the family in such warm and lively atmosphere. On the conclusion of the dinner, all members took picture together to memorize the wonder night. There was not only cooperation and exchange but also passionate performances during the Show. 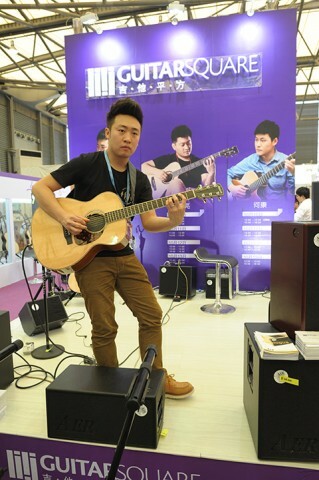 As famous fingerstyle guitarists, CK-Chen, Zhong and Kang gave wonderful performance on the stage with optimate tone tuned by Kane and Udo. 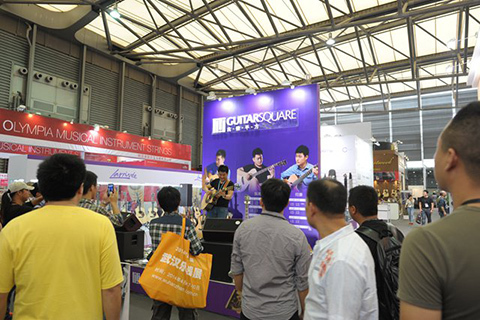 Many visitors were attracted by their delightful performance and pleasing guitar sound and stopped to appreciate the peformance. A lot of fans took pictures with their favouriate guitar player and asked for signature. More surprisingly, Henry Chen who picked lots of championship also visited Guitar Square’s booth and was recognized by our staff. Then he was invited to give performance on our stage. Derserving to be called champion, Henry Chen made the tune even when polising the tone and everyone was surprised by his wonderful performance and super fingerstyle techniques. 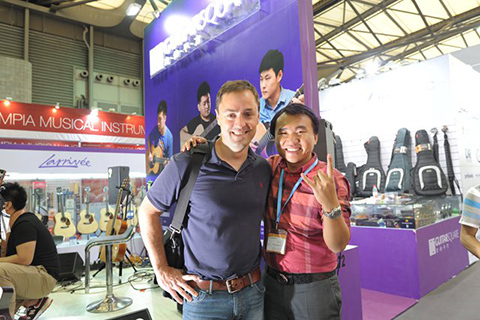 The twelth Shanghai International Exhition for Muscical Instruments and Services concluded successfully on October 13 after 4 days. Hereby, we’d like to extend our sincere gratitudes for every college’s great support and expect more friends to join our family. We are looking forward to building glorious future with you!